Tries: Foster, Teasdale 2, Ormondroyd, Day, Verlinden. Goals: Marginet 4, Teasdale. Catalan Dragons overcame Championship side Featherstone with 12 men in Perpignan to set-up a Challenge Cup quarter-final trip to Hull KR. Jeff Lima's second-half red came after Stan Robin, Julian Bousquet and Elliott Whitehead tries put Catalans 18-12 up. Jack Ormondroyd, Luke Teasdale, Sam Day and Ryan Verlinden tries added to Alex Foster and Teasdale's first-half scores for Rovers. Michael Oldfield, Morgan Escare and Thomas Bosc tries put Catalans through. Still, three-time winners Featherstone, who rested several players ahead of their league meeting with Championship leaders Leigh next week, kept the pressure on and prompted Robin to go for a 79th minute drop-goal to put the result beyond doubt. A much-changed Catalans side - without Todd Carney, Scott Dureau, Zeb Taia, Ben Garcia, Ian Henderson and Jason Baitieri - showed their resilience to fight back three time to overcome the second-tier visitors. 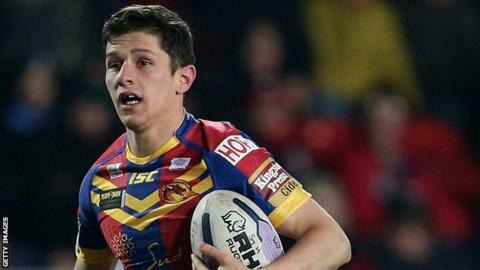 Their only defeat to date came against Super League leaders and Challenge Cup holder Leeds Rhinos. Catalans Dragons: Escare; Oldfield, Gigot, Tonga, Yaha; Bosc, Robin; Lima, Pelissier, Casty, Whitehead, Anderson, Mounis. Replacements: Cardace, Bousquet, Springer, Maria. Featherstone Rovers: Johnson; Blackmore, Minns, Chappell, Sharp; Milner, Marginet; Verlinden, Teasdale, James, Foster, Tonks, Mussey. Replacements: Baldwinson, Ormondroyd, Day, Cooper.